LOS ANGELES, California - Lexus is showing its latest concept, the LF-C2, at the 2014 Los Angeles auto show. The new open-topped (it has neither roof nor cabin covering) concept hints at the design future for the automaker. 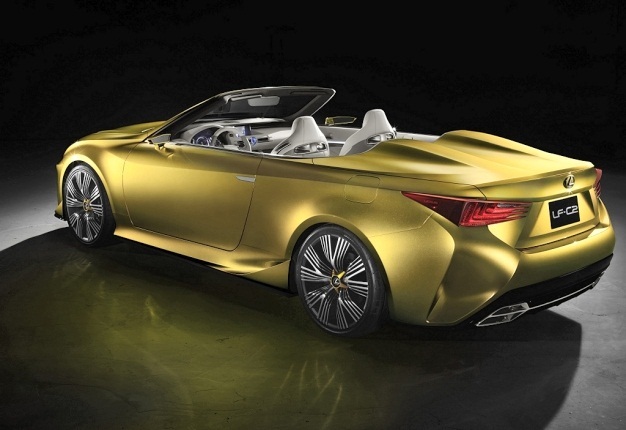 The LF-C2 is 4.7m long, 1.8 wide and 1.3m tall, a 2+2 concept that could be the basis for a drop-top variant of the RC Coupe. The concept also shows a new version of the automaker’s signature spindle grille that uses a 3D, braided-mesh, effect. Its triangular diode headlights were, the autmaker says, inspired by the brand's sports cars. Vents in the front bumper direct cooling air to the brakes and help to manage airflow. A sweeping line extends along its flanks from the front bumper to the steep-angled A-pillar. Small vents in the sills direct air to the rear brakes, exiting through fin-like diffusers. The rear has L-shaped lights, four chromed exhausts and a new rear diffuser design. The concept rides on five-spoked 20” alloys rims. The interior facia has a conventional instrument cluster, a central video screen controlled by a touch pad, and an analogue clock set between the central air vents. It also has soft-touch white/grey leather surfaces and light diodes below the windows.